It's becoming more popular to install pet doors for dogs when you own a home, and there's a good reason for that. A doggy door opens a world of freedom for both you and your pet, and there's plenty of other benefits that come with it. The main reason to get a flap door for your home is if you don't want to play a doorman for your pet anymore. Doors for dogs allow them come and go whenever they need without bothering you. They provide the dog with private access to certain areas of the house or confined area outdoors for play time, which is especially useful when you're away from home. Finding the best dog door for wall or doors may be problematic. Mostly, it's because there are many different types of flap doors and their installations. You need to be clear on the type of door you're looking for, where you're using it and how you plan to install it. How to pick the right fit door for a dog? 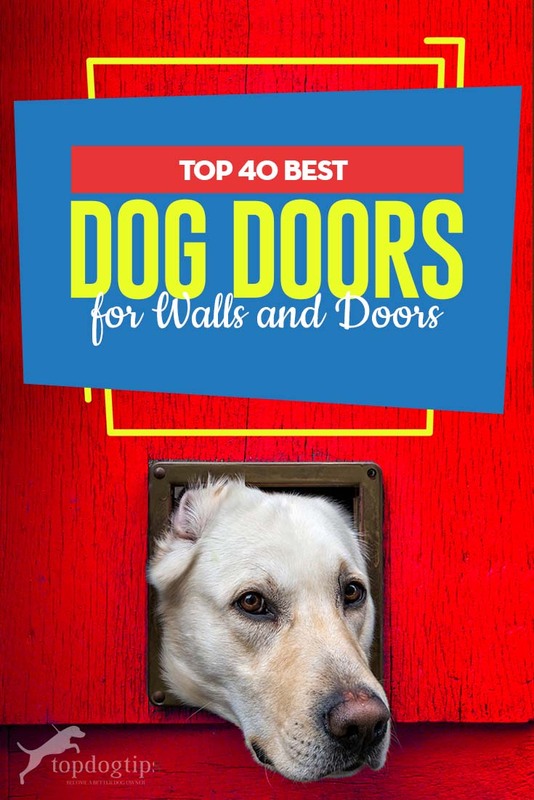 Before you set out to find the most fitting doggy door, there are a few things you need to know to avoid ruining your walls or doors by (a) improperly installing the door, or (b) realizing that you bought a dog door for wall but you needed it for screen doors or other place, or (c) that door is simply too large or too small for your pooch and now it's too late. The door's location – The first thing to consider is exactly where you're going to install the door. Most common flap doors are made for standard wooden doors, but there are other types of canine doors for walls, windows, screen doors, sliding glass and sliding doors, and neither of them are the same. Pick wisely. Your dog's size – Before you buy the door, take your dog's measurements. Have the dog stand still and measure his full length and width. Also, note your dog's weight, because that will also matter. The door's seal – There are two primary types of dog door seals. Either they're energy-efficient, or not. Energy-efficient seal dog doors will best fit more extreme climates, whether it's either too cold or too hot. Energy-efficient pet doors will usually be more expensive; however, they save on energy bills. Security level – Besides the energy-efficient type of seal, some doors offer a better level of security than others in a form of a flap door lock. There are different types of locking dog doors, from electronic dog doors that open for your dog when he's wearing a “SmartKey” collar, to four way manual locks, or even metal panels for extra security. This will help to control your dog's access through doors. With the above in mind, let's take a look at some of the best pet doors for dogs in different categories, and see which ones may be the best fit for you. I encourage you to read other owners' dog door reviews to get a better idea of how exactly the door works so as to avoid disappointment and having to return it. Dog owners who are looking for a cheaper best dog door option will find this to be a good purchase. The Wall Entry doors from Pet Safe have the telescoping tunnel for installation into 4 inch or 6 inch wall constructions. For additional insulation, these doors have a double-flap construction implemented, and it has an adjustable sill with ultra-strong magnets, which also helps with energy efficiency. The locking closing panel and the frame itself are very durable and made out of non-rustic aluminum. 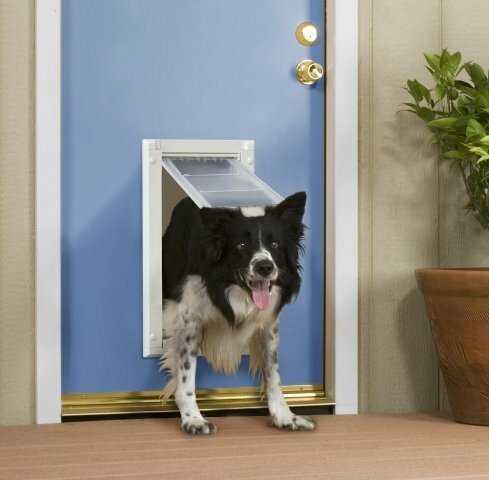 These pet doors for dogs (or cats) mostly fit canines up to 100 pounds. Pros & Cons: The biggest advantage of these doors for dogs is the perfect insulation to protect the house from hot/cold/rainy weather, similarly to how we tested dog beds. They're also very easy to install, and help to maintain a cleaner house for sure. But bear in mind, this is a wall entry door, meaning that you will have to cut through the wall in order to install it, but it's fairly easy (just remember to have all the right tools!) It doesn't really have anything to complain about considering its price and what you'd expect for these pet doors. Also, a few customers reported one or two dogs not wanting to go through these doors. Overall, it's a great value for the price, I believe. Another option for an affordable price from Pet Safe. Not that much more expensive from the above, and not that much better, these pet doors are great for someone looking for a cheap solution too. Helps with energy efficiency, and what's better about this door is that it has 3-flap system (above mentioned has 2 flaps) for even better insulation and protection from bad weather. The frame, however, is not aluminum in this case but very durable plastic. 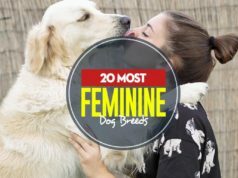 These are also mostly suitable for pets under 100 lbs. Pros & Cons: Shepherds of around 100 lbs fit perfectly through these doors, and most dog owners are very happy that PetSafe doors keep their rooms warm, all mostly because it has not one, but three flaps. One of the issues is the fact that door opening is pretty big, and kids can go through. While adult wouldn't fit, it's something to keep in mind. Another potential issue is measuring – there seem to be some tricky parts regarding this item. I suggest you read through other dog owners' reviews on Amazon as they provide some very good information on how not to get confused and measure these pet doors for dogs properly. The company is known for their manufacturing of very well-made flap doors for house's sliding glass, and sliding glass doors. This item in particular is different from a simple flap-door because it's a patio door in itself. The safety glass is included with the item, and the flap is single-layer made out of soft vinyl. If you've chosen the right type of door, then the installation will also be hassle-free. Out of all brands with flap openings for dogs, this is definitely one of the best value dog doors for sliding doors for the price. Pros & Cons: When you receive the item, it will be very well packaged, so you don't have to worry about the glass breaking. Always remember to measure your pet first before buying this door for dogs, and if you purchase the correct size, then installation should not take more than 10-15 minutes. 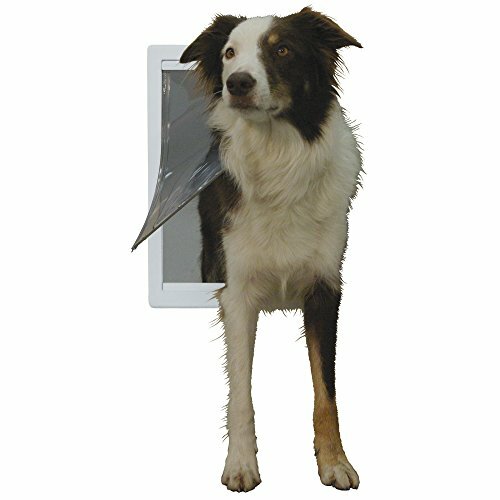 This dog flap door from Ideal Pet Products has a magnetic strip shutter/locker on the bottom which keeps the door always shut. However, dogs (even toy breeds or cats) won't have any problems pushing through it according to the manufacturer and the other dog owners' reviews. It appears that it's definitely worth trying if this is what fits your house since it's more affordable than some other flap doors below. Here's one more from the same company – just as good, except this is not a full-fledged patio door with glass. This product with inner telescopic frame is a better option than doors mentioned at #10 and #9, if you can afford an extra $20. Designed for any kind of weather, energy-efficient, it fits most dogs up to 90 pounds. The installation is very simplified and easy, quick; plus, there's also an installation wall kit available for purchase if you needed (it's optional and sold separately on Amazon). This is definitely one of the most recommended products in the medium-priced range. 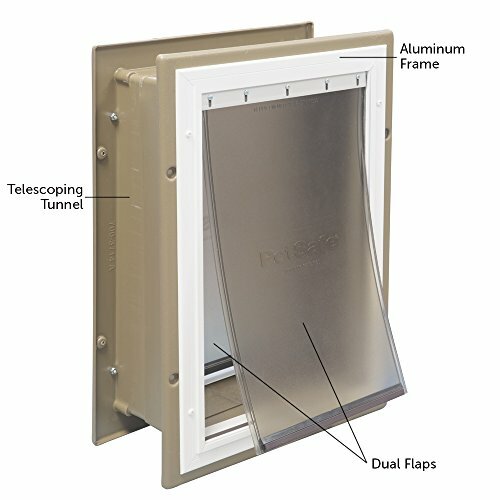 Pros & Cons: A significant amount of customers have upgraded their houses with this pet door, moving from the previously (above) mentioned PetSafe's doors, due to added benefits. There's a customer's review on Amazon which explains ALL the benefits of this door so well that I don't even want to bother writing them down – I suggest you to check that out before purchasing. It's pretty much what it is, and it does its job very well, which is why most dog owners prefer this company's products over PetSafe door of the similar design, according to multiple reviews. Flap doors of this type are the most popular option for dogs and cats, however, they may not be the best fit for every house. Sizing is especially important with these doors and so is ensuring that you have a specific location picked for installing this canine door. Like I mentioned previously, this manufacturer is dominating this category and possibly the whole industry. This item in particular is more fitted for smaller dogs (although different sizes are available) or cats. 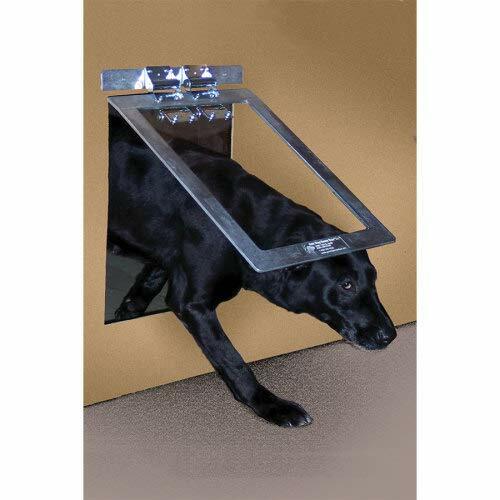 While being a slightly more expensive dog door, this high quality item is made out of non-rustic aluminum construction which keeps them in good condition longer, especially in certain climate. They will be very easy to install (watch the video), and are available with 8 different window sizes and different flap sizes. The system of how this door works is slightly different, so I suggest you to read more and find details about it on the product's page. Pros & Cons: This is definitely a better alternative than putting a whole in the door. Once installed, this door will look very professional and “in place;” they always look as if the doors came with these built in. Insulation strips will be provided. No serious issues have been encountered with these doors – they work just as they're supposed to, so I'd say no cons so far! PetSafe came back with a response of an even better dog doors! If you prefer to install a patio panel door after all, and you found the above mentioned brand not to be your favorite option, then I suggest you giving this one a try instead. It's heavy-duty, frame is made out of aluminum and with tempered glass. No need to cut anything, and installation will be a peace of cake (all instructions provided). Mostly suitable for your sliding glass doors, and fits either left or right side, it doesn't matter. The lock is present on this door, as well as closing panel for additional weather resistance. Pros & Cons: This was one of the best sellers in December. Majority of dog owners are very happy with the value-for-the-price ratio, and considering that it's a heavy duty door for dogs, I agree with them. Most similar dog doors would cost twice as much, and not all of them are better (except for the four down below on this list). Again, according to many dog door reviews, the installation of this door is easy and fast, and the quality of actual door is sturdy. As other flap doors from PetSafe, this one feels as a more expensive pet doors than it actually is; it appears professional and durable, according to reviews. The company claims they will fit any standard sliding doors. 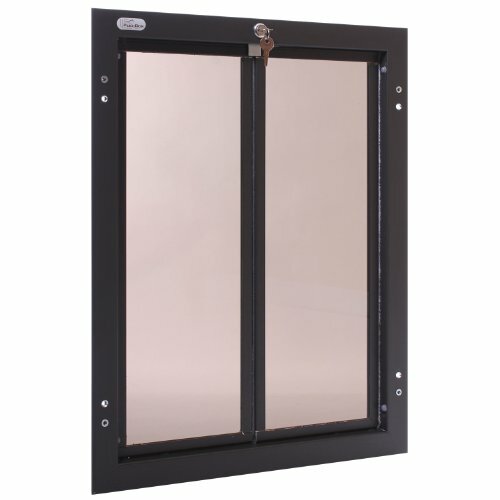 The High Tech Pet is a new flap door manufacturer but their motor-driving and vertically sliding door is one of the very rare and unique designs. It's a smart dog door in a way that it can be activated by an ultrasonic dog collar (MS-4) which makes High Tech Pet's product one of the top recommended products and a very convenient option for many dog owners. Furthermore, it's important to note that the manufacturer considered the dog's behavior when it comes to this smart dog collar and how it opens the door. For example, using directional sensing system, the smart dog door will only open when your dog is in direct line of sight of the door, as in he's trying to exit through the door. The door will not close or open when the dog is simply sleeping close to it. These are bigger than usual and will fit most dogs up to 100 pounds, so they're perfect for medium breeds and large dogs. Installation is relatively easy and secure, and similarly to previously mentioned animal door units, you should refer to the manufacturer's installation manual guide and video. Pros & Cons: As most electronic dog doors, High Tech Pet's product is very energy-efficient, which is one of its main purposes (right there with convenience for lazier pet owners). The 4-way security lock system ensures you have several options to control how your dog moves through the door, which could be “Out Only, In Only, Full Access, No Access.” On top of that, this one also comes with an (automatic) deadbolt feature for extra level of security and a weatherproof shield that has an airtight seal. The only drawback of this electronic dog door (and the main complaint of most customers) is that the smart collar uses a specific set of batteries that can be bought only from the manufacturer. This is obviously a big issue for most because it adds extra cost; however, another review on Amazon for this dog door has proposed a solution to solve this tricky adjustment from the manufacturer. Available either with single flap or double flap, this award-winning Patio Pacific door from Endura is great for all types of weather and climates, unbelievably energy-efficient, and provides 100% wind resistance, even in the most extreme climates. Design is very safe and flexible, durable, well insulated and comes with an environment-friendly door flap that has an adjustable high-grade magnet with perfect balance of strength. Made in the USA, they are ideal for both smaller and even large dog breeds. In addition, the package will include a sturdy, durable security locking cover for this animal door for the times when it's not being used. Pros & Cons: Rated at 4.5 by many dog owners, this is one of the top rated dog doors available. Best thing about this flap door is that unlike many others, it blocks off ALL wind, completely. It's one of the best sealed dog doors and, therefore, the insulation is almost substantially better. The door will never leak no matter what temperature is outside. Furthermore, the door will not show any signs of wear after even years of use because of the high-quality items used in the making. The installation is ultra easy, and same as with dog clippers, you have the best item possible. Lastly, one of the best things about this door which most others don't have is the locking cover: when you put it on, no pet will be able to go through it and seals the opening pretty well. As the second top rated item, we have another one from the award-winning pet door manufacturer Endura! These people certainly know what they're doing, but it will also cost you a pretty penny if you want to invest into dog doors that will last you a very long time (note: most dog doors usually last about 1-3 years). Unlike the previously mentioned door, this is a wall mount, so pay attention. The quality design is primarily based on the Large Door Mount (see above), and only necessary for the wall mount parts have been added to this item, all of which are premium quality items. Pros & Cons: Frame of Endura Patio Pacific flap dog door is sturdy, durable, non-rustic and made out of aluminum which makes it a good option for most climates. It's white and can be installed into siding, stucco or any other wall materials in your house or garage. The size of the opening is ideal for larger dogs, but it can obviously be shared by smaller ones (and yes, they are able to push through). It's made in the USA and just like its “brother” doggy door mentioned above, the Patio Pacific includes a metal locking cover which can be used when the wall mount isn't necessary anymore. 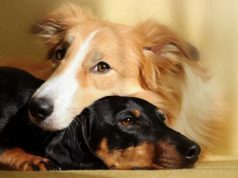 You can learn more about them first hand from other dog owners' reviews, from our instructions similarly to pet gates article, and the manufacturer's page. Dog owners who need a permanent door for dogs will find Endura's product to be one of the best investments due to how well and how long they survive. This is the most heavy duty dog door currently available, best fit for large homes and for extra large dogs. It also solves the security issue that a door for large dogs would usually pose. PlexiDor Performance pet doors is something completely different from the above nine mentioned brands. Therefore, I suggest you to read up on it even more than I can ever write on this article, with the good source of information being Plexidoor reviews on Amazon and the product's and manufacturer's page. The manufacturer guarantees it to be 100% chew-proof, and no replacement door flaps will be required, ever. In addition, there are security features pre-installed on these dog doors: high-grade security lock, key, and a steel security plate. The door is obviously very energy-efficient, any weather-proof, wind resistance, has a special seal and saloon-style Plexiglas panels. The door fits giant dogs up to 220 pounds, and it comes with 5-year warranty. Pros & Cons: The door is big enough even for adult humans to fit through it, so any large dogs – Dogs or Great Danes – will fit well. The style of the door itself is not flap but rather a saloon-type of thing. It's extremely solid, sturdy and feels ultra-durable. Puppies usually have no issue pushing through these doors if needed. It's the most expensive dog door but the materials used are of the highest quality. You can use the lock feature if you want to prevent anything or anybody else from getting through this item. It will definitely keep your energy bill down, and your pooch will soon know what to do with this opening when doors are closed. This door is intended for cats, but it works well for smaller pups as well. Despite being small, we love this door because it has a four-way locking system that allows you to set up your dog for various situations – your dog can only come in from outside, they can only go out from inside, they can come in and out from both sides, or they can’t go in or out. 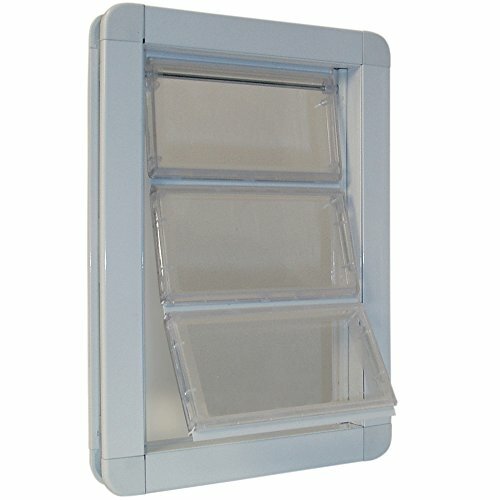 This 7.1” x 7.7” door flap fits any door or wall up to 50mm thick and it’s easy to install which is a great bonus! Larger than the previous door, we like the automatic feature of this one as well as the magnetic seal. The door flap measures 12” x 14” so it’s large enough for small and medium-sized dogs and it’s strong enough to resist impact so it’s a safer door than some thinner options. This pet flap is designed to fit in any screen with just 8 screws which makes it easy for anyone to install. Just keep in mind that this isn’t a flap door for traditional doors or walls. Made from UV stabilized polycarbonate, this dog door is designed for single glazing glass and sliding patio doors from between .12” to .8” thick. The flap measures 11.8” x 10.6” so it fits smaller and small-medium sized dogs but what we like most about this door is how quiet it is! Plus, you don’t have to worry about letting rain or wind in because the edges of the door have a full weather seal. Just make sure to heed the manufacturer warning and don’t install this door anywhere that will give your dog direct access to a pool. Dog doors are harder to come by for BIG dogs but this one fits the bill! Made from aluminum it’s not the prettiest looking door and we don’t recommend it for the decorative front door of a country home, but for a back door, it’s a good and secure option. The flap of the largest door option is 15” x 20” and is clear so that your dog doesn’t wind up headbutting the door when the lockout slide is in place. Plus, this flap has a tamper proof mounting system so it can’t be taken off the door from the outside by intruders. If you’re looking for the top of the line pet door, the Endura Flap Medium Door Mount is available in single flap or double one versions. Our favorite feature of this door is just how weather resistant it is – able to withstand even the strongest winds while being free moving enough to smoothly move with your dog. The flap even has adjustable magnet strength so that you can adjust it to suit your dog’s size, strength, or age. We should also note that this door has a secure locking cover so it can be closed off when it needs to be. From a big name in pet products, the PetSafe product is designed to stand up to big dog use. Although it’s recommended for pets up to 100lbs. we’re not positive that the 10 ¼” x 17 1/8” is going to be big enough for your mastiff to pass through. That said, the durable mesh screen is large enough for some big dogs and we do love the easy sliding locks that keep the door locked in place when it’s not in use. Not all doors come with a warranty, but the Easy Pet Door comes with a lifetime warranty that includes coverage against chewing. It’s an easy to install 11” x 14 ½” door that can be installed with just four screws With no spring hinge this is a quieter door than most and it is weighted so it will swing itself shut every time it’s used. This isn’t a lockable animal door, so we don’t recommend it for the main house, but if you have an outdoor dog house or a garage that your pet uses frequently, this is an option to consider. Another expensive dog door option that’s worth the investment, this door has an opening measuring 15” x 21.5” and it comes with all the bells and whistles and then some! Our favorite feature has to be the lab-certified seal that is tested to be fifteen times better than the requirements for human doors certified by Energy Star. That means that no matter what the temperature outside is, your house won’t lose or gain heat simply through having a doggy door in place! This door also features a security panel to keep the door locked when not in use which is a definite plus. If you are a “tech head” and you want to install an electronic door, the Power Pet PX-1 is a great option to consider. While it is expensive, the kit you purchase comes with an 8 ¼” x 10” motor driven door and an ultrasonic collar that causes the door to open and close automatically when your dog approaches. In addition to the fact that it’s automatic, what we really like about this canine door is that it slides up and down to open rather than swinging in and out which can be startling for nervous or anxious dogs. You don’t have to worry about security with this door either, though, it also has a deadbolt lock in place so that when bedtime comes and everyone is tucked up in bed, the door can be locked out of use. Made by PetCitrus, this is a smaller door that’s designed with small dogs and cats in mind. We love the fact that it can be fit to an indoor, outdoor, interior, and exterior doors which makes it a pretty durable option no matter where you want to mount it. The weatherproof door with brush seal on the outside is great for keeping the cold and heat out of your house too which is a definite plus. This is also a door that can be locked or unlocked in four ways so whichever way you want to allow your pet access to the outdoors, you’re covered. Plus, at under $25, you’ll be hardpressed to find a better doggy door for wall and door use that comes so highly recommended by other pet parents! 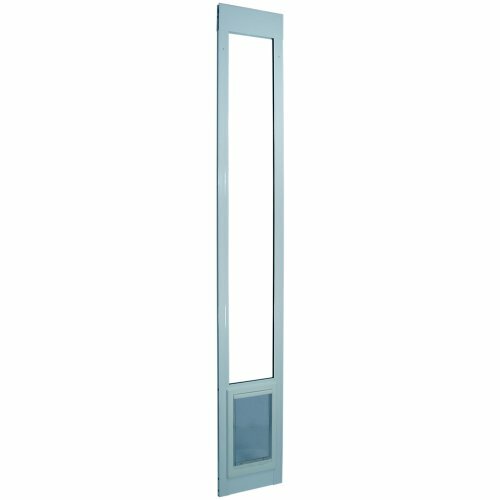 This 18.56” x 13.75” door has a strong aluminum frame and fits doors with a width of 1 ¼” to 1 ¾”. 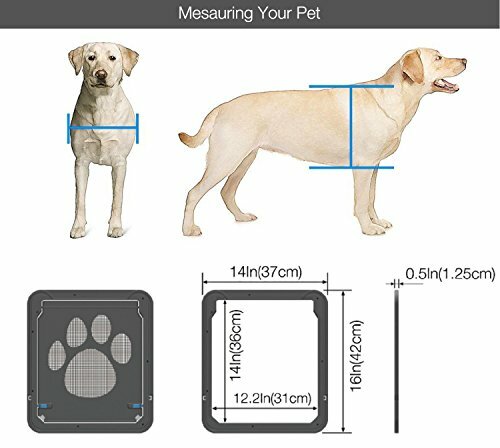 We like that it comes in a variety of sizes, although, we’re not convinced that the size recommendations for pets are quite right so make sure to do your measuring before you buy! This is a softer door which is a great option for senior pups and younger pups and it comes with a 1-year warranty which is a great plus too. If you’re looking for a transparent flappy door, the Petouch door is an affordable door that fits dogs up to 40lbs. Sized 9” x 12”, this is a simple to install option that simply installs with four screws which is a big plus for us, but what we really love is that it comes with a simple cutting template so you can install it without all the guesswork that many other options require. The one thing we don’t love about this option though is that you have to snap on a closing panel to keep it locked so it’s not as easy to close up as some other options. Yes, we are aware that this is advertised as a “cat door” but if you have a small dog humor us because Cat Mate is a quality brand and this door has some great features at a great price. The largest door in this model has a 5 ¾” x 5 7/8” opening so it is only for your very small dog breeds, but the self-lining 2” thick flap makes it a good option for door use. Covered by a three-year guarantee, the Cat Mate door allows you to lock it fully, allow indoor only access, allow outdoor only access and allows you to set a timer so that the door is only functional between certain hours of the day and night. While we love the timer idea, we also love that the actual programming interface of the door is so easy to decipher and program! Another recommended door from PetSafe, this option is also a smart door that activates with a collar so it’s a great option if you’re worried about outside critters coming indoors. The one thing we’re not big on with this door is that you have to pay extra attention when selecting your door because there are multiple options – one comes with just the door, one comes with a battery, one comes with the smart key and one comes with a wall install kit – so be sure to get the full kit if you need it! That said they do have some of the largest item available, the large door, measuring 10 1/8” x 15 3/8” is nice and large for your bigger pups and they even have an extra large option that is 23 5/8” tall for your extra large pups! This medium to large size door measures 12” x 15” and why we love it is because it comes with a three-year warranty! The sturdy metal base of the door makes it suitable for just about any surface from a garage door to a back door and it’s durable as well as silent. We also love that this animal door includes a tunnel that allows you to create a longer depth door for up to 1.25 inches. This door does use a metal panel to prevent access which can be a pain, but it’s a good price and a solid door choice with a great warranty. If you’re looking for a durable and reliable option for your door that is just about as secure as it gets, the Plexidor option is a great pick. This isn’t a budget-friendly item, but it is everything you need from a traditional door style and more. You can snag this one in sizes small through extra-large and the plexiglass is ideal for saving on your energy bill. This door also carries the king of all warranties as it comes with a ten-year manufacturer warranty, something you certainly won’t find on cheaper options. 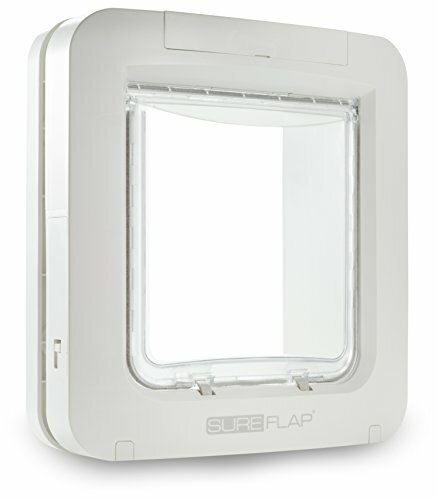 The SureFlap is another microchip activated animal door option, but this one can be paired with your dog’s current microchip as well as with the RFID collar tag that comes with it. The door measures 8” x 9” so it’s not the largest door, but if you have a smaller pup and want to keep outdoor critters outdoors, this is a great choice. While we love the fact that this door pairs with your pet’s existing chip, we love even more that you can set a curfew mode so that the door locks and unlocks itself automatically at specified times. The Perfect Pet doors come in sizes small to super large with the height between 9.25” and 23.5”. This door doesn’t come with the wall kit so you do have to purchase the wall kit separately which is a pain, but the double flaps design and telescoping frame to accommodate walls of varied thickness still make this door a good investment. Plus, this door comes with a lockout slide so you can completely block off the door when you want to keep it off limits without investing in an electronic doggy door option. Another item from the same popular company, this is a cheaper option than their “Ruff-Weather” door but still sturdy enough to stand up to regular use. You can grab this door in sizes 5” x 7” up to 15” x 20” and it comes with a one-year warranty and a lockout slide. Although this isn’t a fancy canine door by any means, it does feature a floating bottom threshold that makes sure that the door seals each time it’s used which is our favorite feature! Like I've mentioned, this brand seems to have taken over our list of best dog doors, but they do have a wide range of options for just about any price point and that’s a huge plus. This aluminum door is one of their more economical options that comes with a limited lifetime warranty and while it’s not the prettiest looking door (we don’t recommend it for your home doors or walls), it is a sturdy option for your garage door or outdoor dog house. We love that this is a more durable item for an economical price but our favorite feature is that it’s so simple to install. The BarksBar is a little less traditional looking and we like it! Made from white plastic and aluminum, this door is durable while still looking presentable. We also love that this door is chew and bite proof tested for that extra peace of mind if your pup is a rough and tumble kind of dog! This is a more durable option when it comes to extreme temperatures and is advertised as non-warping which is a huge plus if you live in a warmer climate. If you’re not a fan of transparent doggy doors (we’re definitely not!) the PetSafe plastic door with a softly tinted flap is an economical and less voyeuristic option. The plastic frame makes this a better door for pups that use their door less frequently, but the price tag makes it a great choice if you’re on a budget. We also love that it still comes with a warranty even though it’s a less expensive door and that it is designed specifically for use on door installations so you’re not paying for extra durability and hardware you don’t need. We know much more about over pampering pets than we do about having a working gun dog, but as we understand it, the working gun dog often tends to sleep in their own quarters. The gun dog heavy duty dog door is designed for these types of quarters and features heavy-duty spring hinges to ensure that the door seals against inclement weather every time. You should also know that because this door is made from welded aluminum and plexiglass, it’s surprisingly durable. An affordable screen door pet door option from OWNPETS, we find this door to be pretty convenient because it fits to screen windows and doors so you can use it just about anywhere in your home. We love the fact that it’s also self-closing and lockable too so it suits just about every type of lifestyle. Despite being so affordable, we found this door to be astonishingly durable and it even looks pretty nice too! These types can be tricky to install which had us worried about this model at first, but it’s actually pretty easy to install so long as you read the instructions thoroughly before you get started and not halfway through the installation like some people we know… The one thing you should pay attention to with this door is that it only comes in a small/medium size (around 16” x 14”) so keep this in mind when you buy. The Armor Flex wall mount space is an airtight door option made from strong aluminum and we love that it’s one of the more energy efficient choices. The price tag on this door is pretty steep, but the security and durability combined with the energy efficient design are worth the investment. We recommend this if you have a regular doggy door user in your home and are tired of making regular replacements and it comes in a range of sizes so you don’t have to struggle to find one that fits your pet. If you’re looking for something to fit your panel door, then this PetSafe insert is a great option and it comes in a range of sizes. Designed specifically for panel doors, we love how thick this is – it can fit 32”, 34”, or 36” paneled doors and the fact that the seal on the door itself is water-tight. Plus, this is a two flap door so it’s much more efficient for keeping the weather out and the heat and air conditioning in! The Carlson Pro-Pets Royal Door Mount is a bi-parting door that comes with a stainless steel security panel as well as a security lock. One of our favorite features of this door is that it has a commercial grade magnetic gasket to ensure that it seals firmly with every use and that it comes with a training tool to help your dog to adjust to using a dog door. This door is available in small to extra-large sizing, but you should keep in mind that the extra-large is over $500! None of the Carlson products are very affordable, but it’s one of the most secure pet door options made to fit doors and walls from 4.75” to 7.5”. The Hale are another costly investment, but they are an investment worth making if you have trouble finding a doggy door that is suited to your pet’s size. 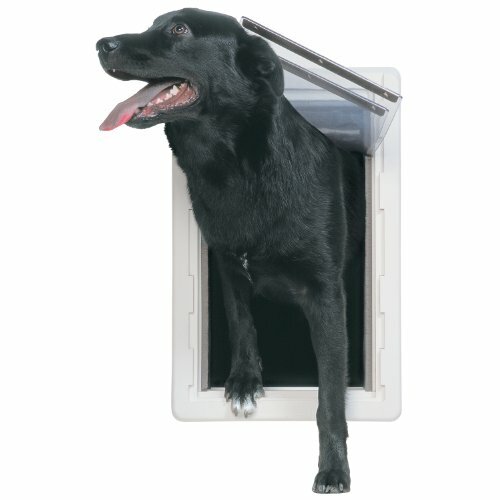 Hale has more than ten different sizes of dog door including doors that are sized for taller breeds of dogs. While we love the wide array of dog door sizes, we also love the selection of colors that they have. Where most doggy doors are either plain white, transparent, or industrial looking, Hale doors come in a variety of brass, silver, black, and white finishes so you can blend them into any façade. The Depets small canine door is only made for your little pups, but it’s one of our favorite small dog options simply because it’s a good-looking door! The Depets door also comes with four locking options for more versatility so you can allow your dog to come inside only, go outside only, go inside and outside, or lock completely so that your door is out of use when you’re not home to secure it. This door is also waterproof and really easy to install. Just keep in mind that the final size of the door flap on this door is 7.08” x 7.48”. If you have a preference for the window style doors, this one comes highly recommended from pet parents everywhere. The width of this door adjusts from 33” to 38” and the extra-large door has a flap that measures 10.5” x 15”. The see-through flap allows your dog to see out before they step out and our favorite feature of this door is that the flexible flap door is made from non-toxic vinyl so you don’t have to worry about your pup’s health while they’re stepping out!